Spring on a plate, at Haven (via Instagram). Asparagus three ways (via Facebook). 1) One of my favorite things about Abura-ya (380 15th St.), Uptown Oakland’s Japanese fried chicken pop-up, is how chef Adachi Hiroyuki shows off farmers’ market produce without making a big deal of it. 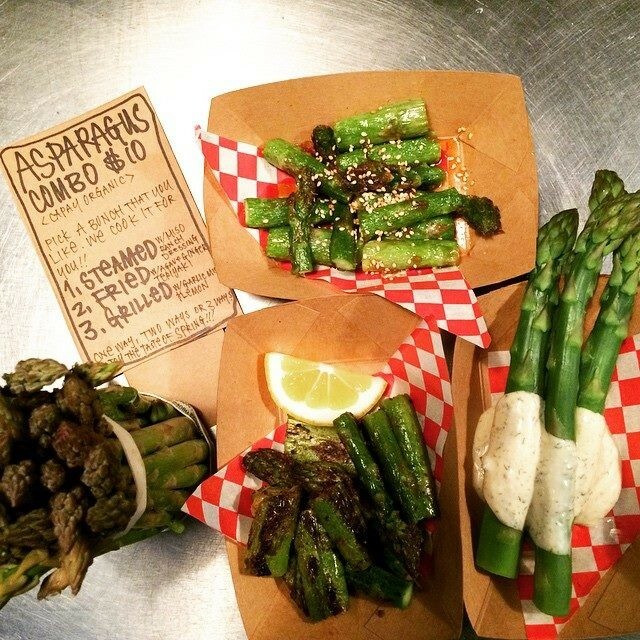 Case in point: The restaurant’s recent spring special features an entire bunch of Capay Organic asparagus served three ways ($10): steamed and topped with miso ranch dressing, grilled with garlic miso seasoning and lemon, and fried with ginger teriyaki sauce. 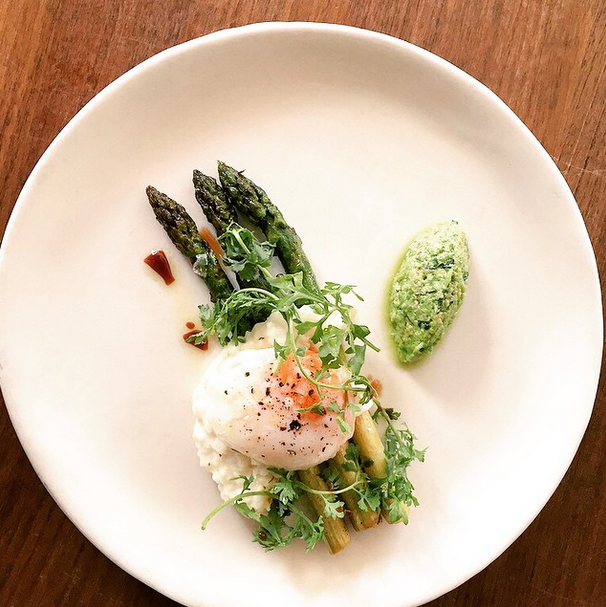 2) If you’re looking for a pretty plate, look no further than Haven (44 Webster St., Oakland), where chef Charlie Parker has been serving “Roscoe’s Asparagus” (see photo up top) — named after farmer Roscoe Zuckerman, who supplies the restaurant with its green bounty. The current version, offered as the vegetarian entrée option for Haven’s $60 dinner prix-fixe, is blanched, then pan-roasted, and served with pea romanesco and a slow-cooked egg. 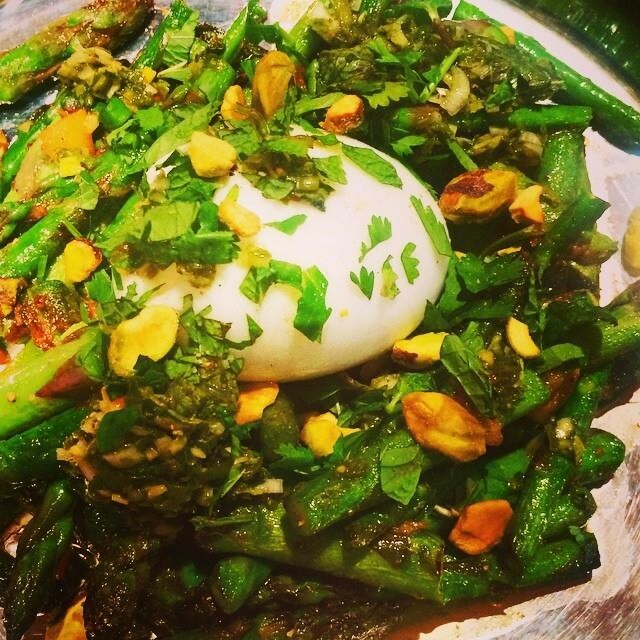 Chef Preeti Mistry's "Asparagus Nest" (via Facebook). 4) Today is the last day you can snag the asparagus burger that Victory Burger (1099 Alcatraz Ave.) has been serving as its Burger of the Week — the restaurant's standard beef patty topped with sautéed asparagus, smoked cremini mushrooms, and spring onion aioli, all served on an Acme kaiser roll. Even if you miss out on the burger, owner Sal Bednarz said asparagus will still be on this coming week's menu in the form of a grilled asparagus and Mayocoba bean salad. Get green at Liba Falafel (via Facebook). 5) Finally, asparagus makes a couple of appearances at Liba Falafel (380 17th St., Oakland) this week: In the falafel toppings bar, you’ll find pieces of asparagus that have been pickled with cumin and coriander. 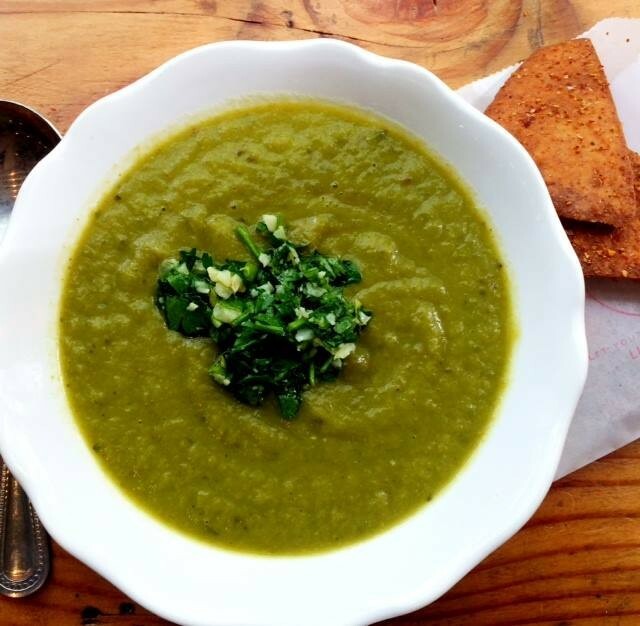 And the soup of the week is a purée of roasted asparagus topped with parsley gremolata: so much green in a single bowl.